Ciara and Russell Wilson were picture perfect as they hit the red carpet of the 2016 Billboard Music Awards. The happily engaged couple walked the carpet holding hands, and Ciara, who looked amazing in a silver chain Philipp Plein gown, couldn’t help but gush a little over her hubby-to-be. “I love my baby!” as they were interviewed on the red carpet. 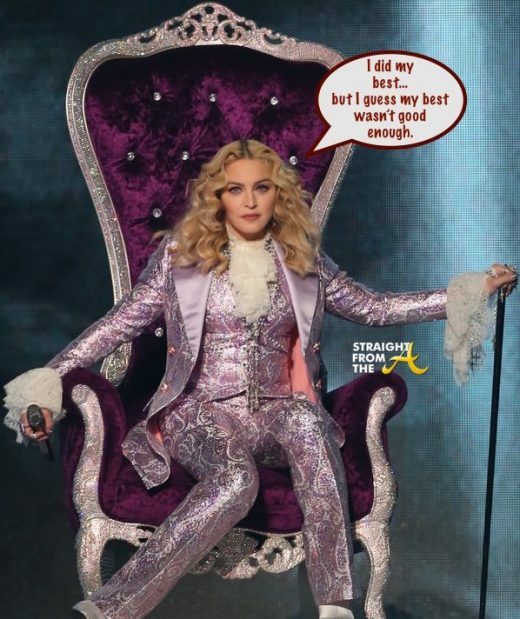 Madonna paid tribute to Prince during the Billboard Music Awards last night and it seems ‘Black Twitter’ is NOT HAPPY! Questlove introduced the tribute, comparing Prince’s death to an “earthquake” and allowing a moment of silence to memorialize the singer. Following the silence, Prince’s voice rang through the venue with his iconic “Dearly beloved…” intro to “Let’s Go Crazy.” Madonna, who collaborated with the singer for “Love Song” off Like a Prayer, appeared onstage on a throne, wearing a glittery purple suit. Towards the end of her cover of ‘Nothing Compares 2 U’, Wonder walked onstage to sing “Purple Rain” before the audience turned the tribute into a massive sing-a-long.